À la Mort Subite is a most impressive 1920s bar, with wooden benches, white walls with carved wood, and impressive pillars. It rather screams 1920s. In the pantheon of restaurants and drinking establishments, I wouldn’t really call À la Mort Subite a restaurant, or even a café. Quite frankly, À la Mort Subite (the name, by the way, means “Sudden Death”, and comes from gambling with dice: the last throw is knows as sudden death, or La Mort Subite) is a beer pub with a light food menu of snacks, salads, sandwiches, and omelettes. 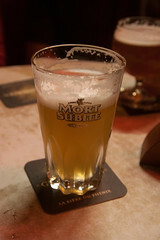 The focus here is on the beer, primarily those brewed by the Belgian brewery Keersmaeker for the pub, including the self-named Mort Subite Lambicks (both brown and blanche), Pêche (Peach Lambick), and Kriek (Cherry Lambick). All are quite good, indeed, I was particularly fond of their house Blanche Lambick, while my brother is still probably trying to coax his local pub into procuring the Mort Subite Pêche as a guest tap. Really, the beer here, while not quite of the reputation of such other stalwarts as Cantillon or Delirium, is indeed first rate. But then the question becomes, what does one consume with their beer? The Belgians love to nosh on snacks while dining, with the standard answers to this being cubed Belgian cheese or various meat products. And the latter was where it was a little fun to learn about Belgian beer snacks, since these were mostly preserved meat products. One of them, tête pressée, I’m familiar with, since it’s what we call head cheese. The next was “Brussels Meat” (translation from the menu), and looking at the next table over, this appeared to be a selection of various pressed meats, including the abovementioned tête pressée, some sort of duck, and two other pressed meats. I opted to pass on that, instead going for the third item: Kip Kap. 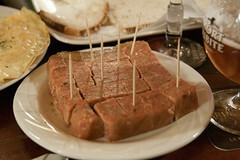 Kip Kap is a common bar snack in Brussels, and it’s basically a diced and pressed meat made from pickled pig cheeks and gelatin. The result, while a bit acidic and salty for my normal noshing, was actually a pleasant counterpart to the beer. That said, I won’t be needing Spam[tm] any time soon. 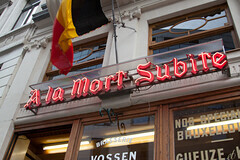 But the rest of the menu at Mort Subite, while lighter fare, is worth mentioning. First of all, the omelettes are really nicely done. It’s a thinner omelette, crisped around the edges, with more than a little gruyere shredded over it. I’m not into omelettes that much, but these were nicely done. 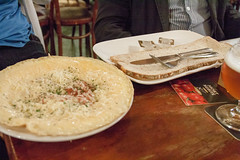 And, as an added attraction, each omelette comes with what is probably one of the largest slices of bread I’ve ever seen (see image at right). 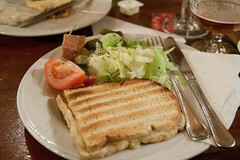 Myself, I opted for one of my simple pleasures: a Croque Monsieur (basically, a French-style grilled ham and cheese). While not the fanciest sandwich or presentation, this was a rather pleasing little treat, with some very flavorful French-style Jamon and a nice, thick layer of shredded gruyere, all melted up and toasted. I’d certainly get this again. So, was the food phenomenal? As a meal, not really. As an accompaniment to their excellent beers, and the wonderful decor? It can’t be beat.